The waters have become a little muddier with the release of a new survey showing that 80 percent of gamers are okay with having to wear glasses in order to play games and watch movies in 3D. A couple of weeks ago we told you about a survey that found that nearly two-thirds of console owners have a gross misunderstanding of how 3D works, believing that a firmware or software update is all that's required to make their equipment capable of displaying it. Even more, 83 percent, were unaware of glasses-free 3D technology on the horizon and nearly half said that glasses were the number-one reason they weren't interested in going 3D at all. 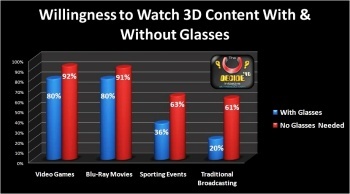 But now another study, this one conducted by the U-Decide Initiative, has been released that contradicts those findings, indicating that 80 percent of gamers say they're perfectly willing to wear glasses in order to experience videogames and Blu-ray movies in 3D. Without glasses, the figures rise to 92 and 91 percent respectively. 65 percent of respondents said they already own an HDTV, while 35 percent are looking to buy a 3D HDTV within the next two years. The survey took in nearly 1200 respondents, 735 gamers that don't yet own 3D equipment and 434 "experienced stereoscopic 3D gamers" who do. The two groups were surveyed separately "to reflect their experience and unique perspectives" and while only the preliminary results have been released, the full report in November will cover a wide range of topics including the breakdown of PC and console gamers, amounts gamers are willing to spend on 3D hardware, obstacles preventing the purchase of 3D equipment and much more. "If you are concerned about the impact Stereovision-3D is having on the gaming market, then you should check out U-Decide's latest findings, and consider becoming a supporting S3DGA [S-3D Gaming Alliance ] member," said Dr. Jon Peddie of Jon Peddie Research. Meant To Be Seen is "the world's first and only stereoscopic 3D Certification and Advocacy group" for both producers and consumers of stereoscopic 3D technology. It is also the consumer arm of the S-3D Gaming Alliance, whose members include Panasonic, LG, EA, Blitz Games Studios and others. The U-Decide survey was "made possible" by the S3DGA, EA, Ubisoft, Blitz Games Studios, Steelseries, Panasonic, Computer Power User and Zalman. But there's a big difference between being willing to wear glasses while you game, and being willing to fork over a couple hundred bucks apiece for them. So what's it all prove? Two things, I think: The 3D arena is still fraught with risk and statistics can be used to prove pretty much whatever you want them to.